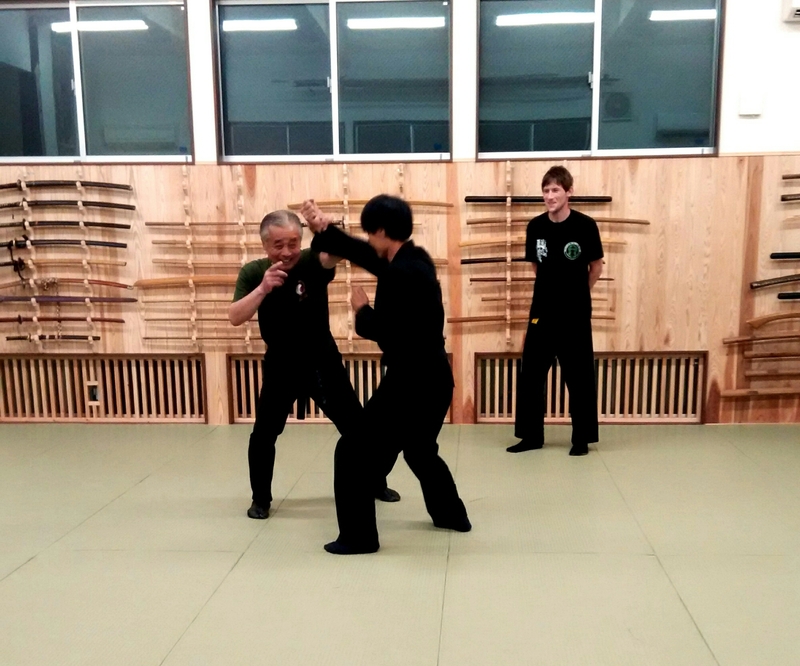 We were only 8 participants for Wednesday’s class with Noguchi sensei. What a luxury! As always with him we went fast, so fast that I got confused me than usual. My confusion was not based on the techniques we did (it was the first and second level of Gyokko ryû), but by the way he unfolded these techniques. Everything was different thus remaining the same. His interpretation based on the essence of each waza he came up with waza that felt so different that it was like studying the Ura Gata of Gyokko ryû. My American partner and I were feeling like beginners, unable to find in these supposed well-known forms the usual waza. For example we did Dashin from a front attack or a side attack; Dan Shu and Dan Shi were studied with so much freedom that it was as if they were different techniques. Shuhari is the true Tenchijin. Often people ask me why I keep going to train in Japan. My answer is always the same: I go to dig deeper in the supposed knowledge I have. Ranks are one thing, but there is an enormous gap between our abilities to do the basic waza (chi) compared to adapting the essence of the waza to a new reality (ten). “The sky is the limit,” says the proverb but we often remain at the ground level. We keep repeating dead forms and do not allow our bodies to drift away from them. This is Ten vs. Chi. But there is even more than reaching the Ten level, there is the Jin level. And the Jin, is only possible to learn when you train here with a Japanese Dai Shihan and with Sensei. If sometimes we succeed to reach the Ten, we are still missing the Jin. What we did yesterday was a set of techniques inspired by the gods: a Jin approach of the Gyokko ryû. And this is why you have to come to Japan every year (at least). Your Dan rank is not a proof of your expertise. The Japanese Dai Shihan are experts. They have been training nearly fifty years, and they have refined their understanding so much that the technique doesn’t exist anymore, they have reached the Ri where only the flow remains. When Sensei says that we have to be relaxed and not to do techniques because they would kill us, it makes sense. We have to follow the path of the Tenchijin / Shuhari and continue to learn. There is no end. Wow that far down the rabbit hole !